The pH of our hair is about 5. Some sources say the pH of shampoos should range between 6.0-8.0 while others say the ideal pH is 5.5. Another source suggests between 4.0-7.0. Whatever the ideal number, the truth is the pH of our hair is 5 for a reason ... and to knock that balance way off can cause problems (e.g., dryness, roughness, cuticle lifting, scalp fungal growth, etc.). *Why no poo no more? My no poo routine consisted of using 1 part baking soda, 2-3 parts conditioner, and 3 parts water. I loved the mixture because it cleansed my scalp really well while not stripping my hair. However, this routine is nixed in light of the following informative sources - Kimmaytube's pH video and thenaturalhaven's baking soda post. I knew beforehand that baking soda was alkaline (i.e., high pH), but I did not know that though I diluted it with conditioner (slightly acidic) and water (neutral), it was still pretty high. I tested the solution myself and saw a whopping pH of 9. Even though I follow up with an ACV rinse (pH of 4), I don't know what long-term effect this routine will have on my hair and scalp ... so I'll stop now. You smelled it right! I will be reviewing this in the near future. Any vegans or vegetarians out there will be happy to know that this shampoo is 100% vegan. 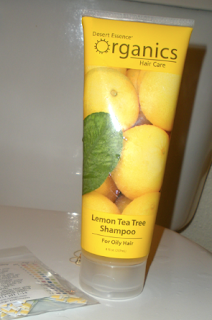 The Lemon Tee Tree shampoo boasts containing: jojoba seed oil to loosen and dissolve excess oil and build-up on the scalp and hair, high-quality Austrailian Tea Tree Oil to provide antiseptic qualities, sugar cleansers, and more. Nice to see that you tested it yourself! I am personally not against sulphates because they do a good job of stripping oil. I tried a sulphate free formulation and ended up with build up similar to when I tried co washing. I went back to SLS. I think experimenting is the way forward. I did really like that you did your own investigation! Thank you, Ms. Scientist herself! All the talk was enough to make me test it and see. After watching Kimmay's video I was also too through with baking soda. I want to get those ph strips to carry around with me while I shop for hair products. That video scared me. Lol! The pH strips certainly come in handy. I am thailand.i have yet to try this brand even though its so accessible to me. i saw from the ad their range are suitable for asian hair..